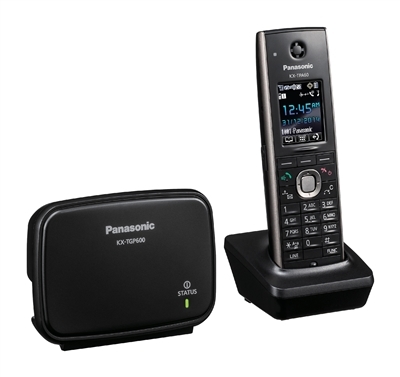 The Panasonic KX-TGP600 offers a great value single cell DECT solution that is remarkably easy to set up and manage. Its automated provisioning function enables easy deployment plus remote configuration of settings and handset management. The KX-TGP600 consists of a DECT base station and a single KX-TPA60 handset which offers a 1.8" colour LCD backlight display, plus HD wideband audio (G.722) and a 500 capacity phone book. The TGP600 enables users to connect up to 8 DECT handsets and allows up to 8 simultaneous calls. In addition the TGP600G DECT base station also offers users the option to use the new KX-TPA65 DECT desk phone as an alternative to the cordless TPA60 handset. The TPA65 is ideal for business users who want the convenience of a desk phone for normal telephone use but without the complications of connecting it to a phone line or network. The KX-TGP600G DECT Base station can also be purchased as a stand alone item, enabling you to mix and match compatible handsets to create the solution your users require.